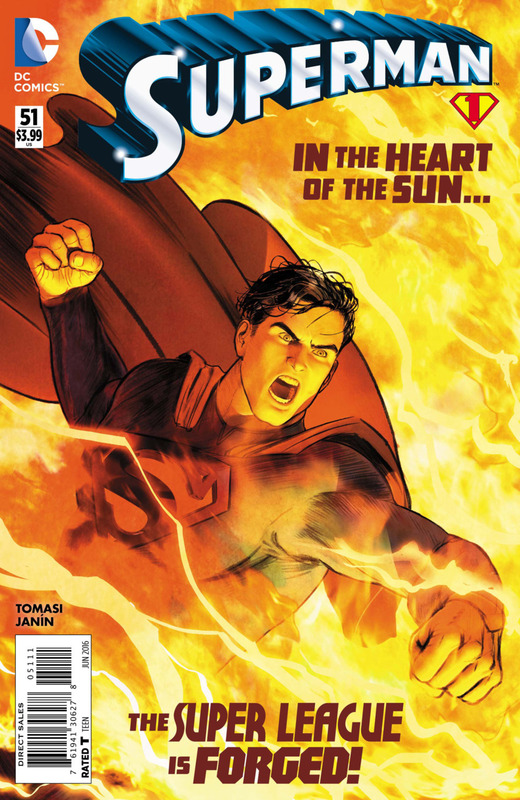 "The Final Days of Superman, Part 1: This Mortal Coil"
I know I try to keep this blog fairly steeped in DC Comics history, only visiting contemporary stories when they actually move me to do so. I'm pleased to say this is happening a little more often of late. DC is really firing on all cylinders, at least in as far as the books that I'm reading. I thought for certain that once the Rebirth announcements happened, we would be entering into something of a lame-duck period until the re-whatever-it's-gonna-be was put in place. I can say with a modicum of certainty that this is not the case (again, at least in the books I'm following). This issue of Superman was an unexpected delight, and I am looking forward to sharing my thoughts on it. By the way... don't look now, but... I think that's a triangle number under the logo. I'll concede that I'm perhaps a bit more giddy over that than I should be. Since this is a new-one, I'll keep my comments somewhat brief lest I spoil too much. We open with the troubling realization that Superman is dying. He is at the Fortress, and is putting himself through some vigorous tests. He thinks back to all of the recent events that led him here, including the Kryptonite vault from Savage Dawn, the Darkseid War, and even his battle with Rao (so I guess Justice League of America is in continuity after all!). Superman bids Krypto farewell and heads out saving many a distressed citizen along the way. He lands in Smallville at the Lang home where he finds Lana attending to some yard work. The two reconnect, and share a touching moment on the swings. Clark takes Lana to his parents' grave site and fills her in on his current mortality-related issues. He asks that she bury him alongside his folks. Back in Metropolis Superman reconnects with Lois Lane. He picks her up at her apartment and takes her for a flight. He tells her he wants her to tell the world the story of his life, both as Clark Kent and as Superman. Intermittently throughout this issue we observe snippets related to the upcoming Gene Luen Yang series New Super-Man featuring the character of Kenan Kong. We don't get much, but I am fairly intrigued by what we did get. Now, where has this guy been? For much of the past half-decade I have been aggressively opposed to accepting this Superman. He would never be my post-Crisis Clark Kent, and ever since Convergence I'd been waiting for the real-steel-deal to retake his proper place in the DC Universe... and now, the New-52 CK is finally acting like the man he was born to become... right as we're learning he may not escape this story line with his life. Crazy. I thoroughly enjoyed this issue. It really made me feel something for this version of Superman. I can literally count on my hand how many times I'd been emotionally invested in Superman since Flashpoint, however, and this is a testament to the talents of Peter J. Tomasi and Mikel Janin... I now actually care about this character. A wonderful issue, words and art alike, from first-page to last. I anxiously await what's to come, and I cannot believe I'm actually somewhat fearful and upset that this (fake, bogus, imposter) Superman may actually die. If we really are replacing the new with the old, I must admit... it is kind of bittersweet. Comics generations seem to move faster than "real" generations, so I think I can comfortably say that... if new CK is bound for the ground, a generation of (DC) Comics fans are losing their Superman... that doesn't make me nearly as happy as I thought it would. I remember when the announcement of the New-52 occurred, and message boards were filled with folks celebrating that the old characters were being written out, and mocking those of us who were upset by it. We were the old guard, that needed to go... and yet, here we are. I can't celebrate this character's passing (if that even what we're in for), even if only for the retribution of the thing. If this is/was your Superman, you had a good one. After reading this issue, I'll miss him too. Oh, and did I mention... triangle numbering??? Definitely recommended. Not quite Batman v Joker in NASCAR on TBS, but what can ya do?